Jane Austen Society of North American: Connecticut Chapter: What to Wear? Gloves * Shawls * Shoes * Corsets *Misc. Katina Mitsopoulos is very knowledgable and competent. Her expertise is in Revolutionary clothing, still appropriate for a Regency Assembly Ball. She woks out of Hampton CT (near Pomfret). Butterick has two gorgeous Emma-type patterns in their costume section. The patterns are in their "Making History" collection and are numbered: #6630 and #6631. #6630 includes two different ball gowns (one with a train) and a long sleeved empire waist coat for over the dress. #6631 has a pattern for a rather low cut "V" necked gown and a gorgeous spencer. Both of these patterns call for hooks, eyes and buttons. You get a free pattern simply for looking at their website. Maybe you could choose one of these! 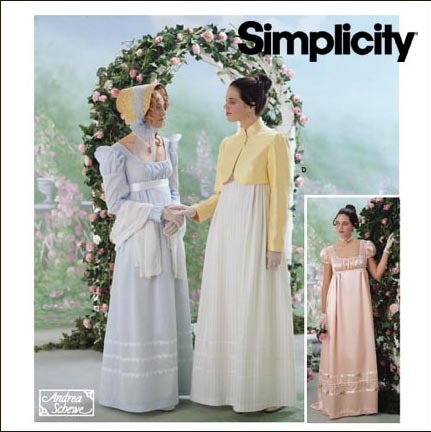 Simplicity carries two different Regency style patterns. One, #9221, features two different Pride and Prejudice style gowns and a spencer. The other, #9225, looks more like a Kate Greenway style dress, but includes patterns for a bonnet, cap, shawl and gauntlet gloves. The dresses have lower waists and longer (elbow-length) sleeves than the first pattern. These dresses call for hooks, eyes and zippers. Jennie Chancey has a wonderful site which includes instructions for making your gown, and a terriffic pattern for both dresses and undergarments. She is also a seamstress and will make up dresses to your specifications. Regency Regalia is run by Lauryl Lane, a professionally trained seamstress and personal friend. She is currently taking orders. Check out her site for pictures of her work. Past & Present creations is run by Tracie Arnold. She will work with you to create any dress from a movie or of your own design. Visit her site for photos of her work. Jas. 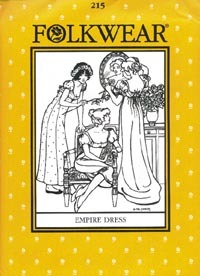 Townsend and Son carry the hard to find Folkwear patterns which include Regency dresses and cloaks. They also carry Revolutionary War patterns and Menswear. La Mode Bagatelle was one of the first to offer a full Regency wear pattern. You can visit their site for more information. 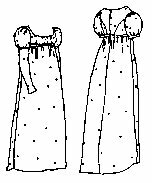 Folkwear pattern #215 is a lovely Regency Gown. It can be bought from Jas. Townsend and Son, Inc or Amazon Drygoods. A Review of this pattern is available here: The Heyerlist. Period Impressions pattern #460 is another beautiful Regency Gown. It too can be bought from Jas. Townsend and Son, Inc or Amazon Drygoods. A Review of this pattern is available here: The Heyerlist. It has options for both short and long sleeves. Devoted to Georgette Heyer, this page, nonetheless, boasts an impressive list of Regency gown patterns and reviews. Want to know how easy or difficult these patterns really are? Look here! A specially prepared article by Marc Casslar. How to create a period ensemble from clothes you already own. Regency Gent, run by Marie-Bernadette Strang, features custom made gentlemen's attire, as well as ready made articles such as gloves, stockings, and braces. Ages of Elegance specializes in the manufacture of historical clothing for Weddings, Museums, Collectors and Re-enactors. Yes, a lot of it you wouldn't be caught dead in, but International Male IS your source for ruffled Regency shirts (look under shirts: novelty,) cloaks and other clothing items. A wide selection at affordable prices. Also visit the Men's Wear page at Austentation. I was also able to find the same thing (scented sandlewood fan) at Cost Plus for $2.99. Nature's Intent now carries a wide variety of imported shawls- from Pashmina to imported wool and silk and more! They are perfect for use with your Regency gown. Check them out here! Gloves are one of the more readily available accesssories. Most department stores carry them, at least at Christmas and from Easter through the busy Prom/Wedding season. Many "Teen" stores such as Claire's Boutique also carry them. For authentic "Kid" gloves, try antique stores and tag sales. It is not very difficult to find shoes to go with your period dress. Ballet flats look nice and come in a variety of colors. Try to get leather ones if possible. Lace up half-boots are also appropriate for day wear. www.weddingsforless carries a wide variety of ballet shoes and bridal slippers. Check out their fabulous selection. Jennie Chancey sells a fabulous "boned chemise" pattern that is quite easy to make. Visit her site for more information. Yes, ladies. Among other things Fredericks does sell *passable* corsets for your gown. Both 50640 and 51350 are workable with Regency fashion. Even Ebay has a special corset section. You can check out what's available- many new items for nearly half the retail price- but do be careful! carries a wide assortment of goods including steel corset stays, beautiful cloak clasps, buttons, coins, and the Folkwear dress and cloak patterns. Definately ask for their free catalog! is a fine on-line supplier of reproduction clothing. They have a wonderful selection of ladies caps and cloth bonnets (all reasonably priced) as well as several styles of plain straw hats. They carry ostrich plumes, steel corset stays, and other finishing touches, as well as completed garments and accessories. 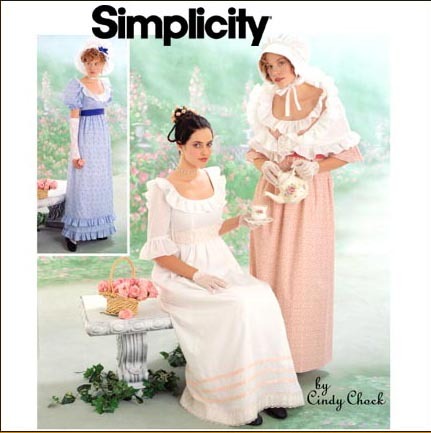 also carries ready made women's garments including drawers and a bustier, as well as petticoats, stockings, and mitts. Their wool felt bonnets are beautiful and hard to find. They come in a variety of colors. They also have the best price on mob caps and cloth sunbonnets I have yet seen ($5). You will need to e-mail them for a catalog, though, since they are not yet on-line.